Mmmmm, I would take chicken thighs over chicken breasts in a flash. They are much more moist (isn’t that just the worst word? moist… moist… blegh!) Yes, they are pretty small, but it’s OK because then you can eat two, or three (or four…) of your favourite chicken thighs. This is a pretty simple recipe which just calls for a marinade which helps to keeps the meat from going dry. This chicken is the perfect partner with Meatless Monday’s kickin‘ potatoes or my favourite sweet potato fries! Preheat oven to 375 degrees. Whisk together all of the ingredients for the marinade and marinade the chicken in the fridge for an hour. After the chicken is done marinating place it in a dish and bake for 30 minutes. 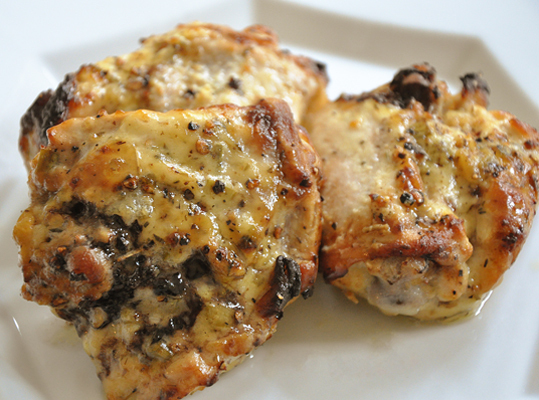 Try out this recipe and enjoy some of my favourite chicken thighs. « Kickin’ Parmesan Roasted Potatoes …. Meatless Monday! Loving the way these chicken thighs are lookin' Lou!! Thanks so much! Hope you like the way they taste if you ever try 'em! Do you bake them in the marinade? Or you remove the chicken from the marinade completely once you put it in the pan? this chicken was pretty good...very moist...i made it with the 'kickin potatoes' which were awesome - i loved the heat kick. i had a little bit of the parm mixture leftover so i added it to the broccoli i made to go along with it. Thanks for sharing! I have used this super simple recipe many times. I am a die hard thigh fan, too! I recently added it to a collection of freezer meals I wrote about in my very new blog. Keep cooking! Hi Kristin - I'm so glad you love this recipe, thanks for letting me know and best of luck with your new blog! Do you think it is absolutely necessary to use the yogurt on this recipe? I have friends who keep Kosher and cannot have the dairy with the meat? Thank you for your response. Hi Tammy, great question!I'm sure that these would work fine without the yogurt - the flavour might be slightly different but the recipe should still work. That said, I've never tried it, so please let me know how it goes!